All ESL adults welcome. Practice your English conversation skills in a relaxed, supportive environment. Purchase, reload or replace Tap Cards at the library. Fitness Trainer Vivian Mercado wants to help you unwind with her beginners' stretching class. For ages 15 and up. Yoga mats recommended. Monday-Thursday 2:30 - 5:30 p.m.
Students K-12 have access to laptops with internet and word processing, databases, and online homework help. Free printing for homework. Volunteer tutors work one-on-one, helping adults improve basic reading and writing skills. For more information call (213) 228-7037 ext. 70819, or write echoparkliteracy@lapl.org. Our volunteer STAR Readers are here and ready for all kids who love to share a good book. Miss Jessica will be at the library on Wednesdays from 10 a.m. to 12 noon. 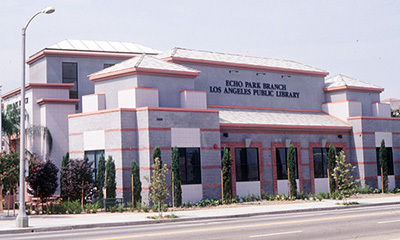 Mr. Ruben will be at the library on Mondays and Thursdays from 4 to 5 p.m.
Echo Park is located in the First District, represented by Councilmember Gilbert Cedillo.